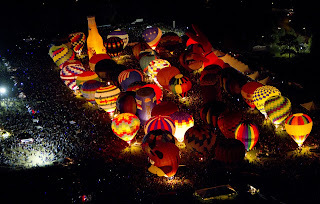 Balloon Glow: Finally Made it! We finally made it to the Balloon Glow this year! I'm a bit ashamed to admit that I've lived here for the majority of my life and have never been. It was amazing! There's really nothing to compare it to. It's truly a unique experience. Yes it's crowded, but if you plan correctly it's doable. The kids really enjoyed it. I don't think they had any idea what to expect, so when the balloons start to inflate they got really excited. When I was a little girl a hot air balloon crashed in the middle of the street just a few houses down from my childhood home. Poor guy broke his leg. There's never a dull moment! We definitely want to go next year. Who else is in? were those actual pictures you took? Yes, the top two are mine. Glad you went! I've heard it's awesome and sure wish we would have gone.